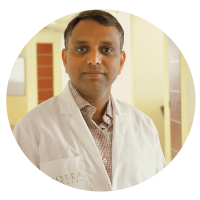 Dr. Ashu Kumar Jain is a renowned Pain Physician and is presently working as Deptt. Head, Pain Medicine with Artemis Health institute , Sector 51 , Gurgoan , Haryana (INDIA) . He established Deptt. of Pain Medicine at Artemis Health Institute. During his tenure in Fellowship , he learned the diagnostic work-up and medical management of chronic painful illnesses such as Chronic Low Back/Neck pain , Sciatica , Slip Disc , Pelvic Pain ( females ) due to various etiologies, Rheumatological diseases including Rheumatoid Arthritis, Ankylosing Spondylitis , Knee Pain , Hip & Shoulder Pain and others, Chronic cancer pain patients, headache patients and patients with various other chronic-difficult pain syndromes like CRPS I & II , Phantom Limb Syndrome , Fibromyalgesia, Trigeminal Neuralgia . He is well versed in use of various classes of drugs particularly- NSAIDS, Anti-Neuropathic Drugs, Narcotic Agents such as Morphine/ Fentanyl etc., DMARDS & Biological agents such as Leflunamide, methotrexate, etarnacept, infliximab & others via different modes of delivery like oral/I.M./I.V./subcutaneous/neuraxial etc. He knows how to use these agents effectively and how to follow up these patients for prevention and management of their side effects and complications. In the Operation Theatre, he became proficient in various ‘Interventional Pain Management Procedures’ using C-Arm Fluoroscopic & Ultrasound guidance & including the basic interventions such as Lumbar Facet Joint, Transforaminal steroid inj., Median Branch injection, SIJ inj., peripheral joint injections such as knee/shoulder/hip injections etc and advanced procedures such as Percutaneous Disc Decompressions (Cervical & Lumber), Adhesiolysis procedures, Cervical/Thoracic- TLESIs & TFESIs, Facet & MBB/RFTC, DRG-RF/PRF, Percutaneous Vertebroplasties, High Cervical Chordotomies, Gasserian Ganglion RFTC/ neurolytic rhizolysis/ Balloon compression and many other interventions useful in pain management.